According to the latest customs statistics, China’s tin ore and concentrate imports in December 2018 totalled 18,162 tonnes, 17,667 tonnes of which originated from Myanmar. We estimate that the tin content of shipments from Myanmar in December was 4,800 tonnes, up 20% month-on-month, but down 58% year-on-year. The tin metal content of shipments from Myanmar totalled some 54,600 tonnes in 2018, down 19% year-on-year. 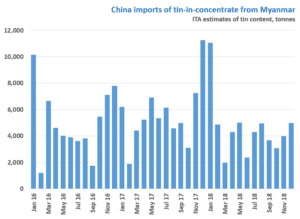 Reported Chinese exports of refined tin in 2018 totalled 6,078 tonnes, almost treble the 2,175 tonnes in 2017, while imports in 2018 were reported to be 2,544 tonnes. Our View: The average tin grade of concentrate shipped from Myanmar in December 2018 was inferred to have increased to 27% from 23% in November, based on feedback from traders and a comparison of the unit price of imported concentrate. However, Myanmar shipments in December 2018 were sharply down compared to the same period last year, in which 11,300 tonnes of ore and concentrate were imported, the highest monthly total on record. Although there is still pressure on traders and mining companies in Myanmar to sell stocks to pay worker salaries and debt before the Chinese Spring Festival, depletion of both ore and concentrate stocks has meant that shipments did not reach their past peak. We forecast tin content shipped to China from Myanmar in 2019 will further reduce to around 46,000 tonnes, although forecasting Myanmar production remains subject to significant uncertainty.